I know it's been a while. Largely because I'm working on getting my writing schedule under control. Anything that isn't Stella Moon is a distraction. And I mean a distraction. This morning I managed to clean up from breakfast, unpack the dishwasher, attempt to take on shopnhl.com (Larry got a gift certificate for his birthday specifically to buy a Team Canada hockey jersey, but they don't have any TC jerseys and they wouldn't refund the $, grrrr; and then I opened my computer to start my writing day, but HAD to check email; saw something I'd forgotten to do, so managed to spend another twenty minutes on phone calls. It's amazing how one can procrastinate. Or maybe not so amazing. Just predictable. But I did get a few pages written--a victory for the day--so here I am. Alas there's not much to tell about the present. My mind is full of the future 500 years hence. Here and there, however, I am reading a good book. It won the RT Re viewer's Choice award in scifi this year. I got a copy of it at the convention. 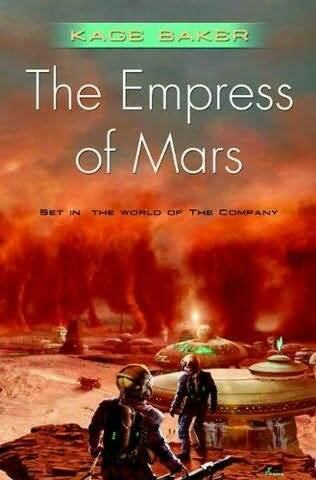 It's called The Empress of Mars by Kage Baker. Very entertaining and quirky with lots of great world building and fun characters. Oh, and don't be fooled by the spacesuited weirdos and flying saucers on the cover. The book is not a boy's adventure about fighting insect-looking aliens. First published as a novella, it won the Sturgeon Award--whatever that is--and was also nominated for a Hugo and a Nebula. Ms. Baker passed away recently and her site is undergoing revision, but it is being maintained and there's a lot about her books and the Empress of Mars. This is not a romance, but then, I'm trying a little sideways jump here myself. Anyway, if you're looking for a distraction (I swear--I'm not...) this is a good one.